Nothing pleases me more than the opportunity to bring ancient art to life again in skin. 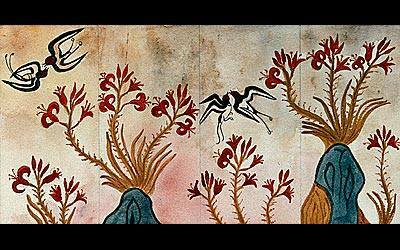 These birds are from a fresco in Akrotiri, Santorini, known as the Minoan Pompeii. A Bronze Age civilization on the island then called Thera was destroyed by a massive volcanic eruption in 1600BC, and some speculation says that this was the origin of the Atlantis story. They lived in beautiful homes with walls covered with fabulous decorations, and a room painted with spring lilies and birds has been carefully preserved in the National Archeological Museum. These birds fly again on a shapely leg. The Santorini fresco the birds came from - it is always good to encourage people to look for something in the world of art that they feel a resonance with as the inspiration for their tattoos, instead of just thinking to look for a "tattoo image" that has already been done in this medium.